Matte Metallics Paint Discounts Apply ! 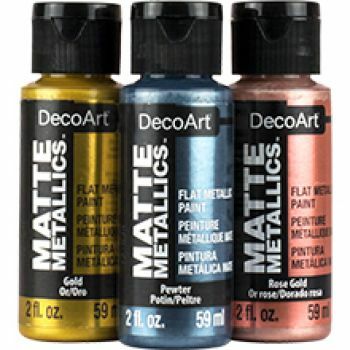 Add a matte metallic sheen to projects with DecoArt Matte Metallics. Offered in a variety of trendy and classic colors, you are guaranteed excellent adhesion and rich, smooth coverage on all your projects. Durable, low-sheen metallic finish Ultra-fine pigments for a rich smooth finish Water-based Soap and water clean-up Made in the USA 2oz bottle.